Sell your Home FAST & for TOP Dollar! 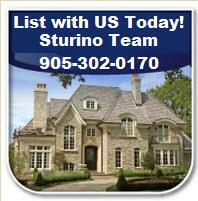 with the STURINO TEAM's Guaranteed Homeselling System! Our Homes Sell on average in 12.5 Days ! Findout why We Sell Fast & For TOP Dollar! Longtime Oakville Residents & Oakville Realtors-We Know Oakville! Please complete and submit the following Pre-Listing form below and we will contact us as soon as possible.